12 Things You Probably Don’t Know About Eclipse Corporation and DocOrigin, Continued…. If you missed the first 7, check it out here. Only four simple steps with a user-friendly interface. Dynamic Business Documents allows companies to generate and preview documents in their ERP, CRM and other enterprise software systems and communicates with DocOrigin through its own web services. 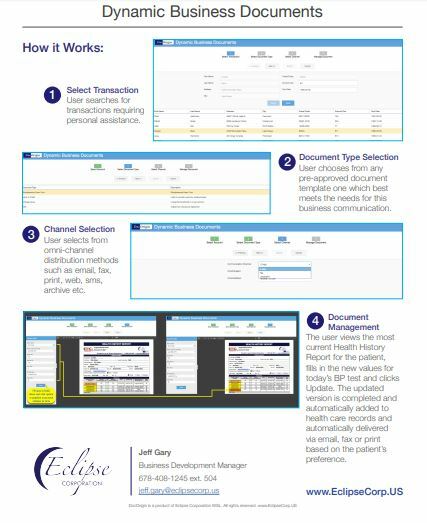 With DBD, authorized employees from a single department or the whole enterprise can use pre-approved document templates and content to create professional business correspondence and other personalized documents in only four simple steps through a user-friendly interface (no scripting). After modifying the template, users can select any form of omni-channel delivery and presentation. 9. We meet your needs without changing your line of business software. With our methodology, Integration Without ModificationTM, you can use DocOrigin without altering your business software. This is just another reason why DocOrigin is perfect for any industry. DocOrigin now integrates the design and creation of Universally Accessible PDFs (PDF/UA), meeting ISO 14289-1 and WCAG 2.0 standards for PDF documents, into its flagship document generation software. The World Health Organization estimates 246 million people worldwide suffer from some form of visual impairment – with 39 million of those classified as blind. With PDF/UA conforming files, readers and assistive technology, these individuals and others with disabilities can have equal access to online information. PDF/A-3 allows you to include all pertinent files in a PDF. The PDF/A-3 acts as a wrapper to contain all the documents and supporting files that make up the packet. Users can embed Word, HTML, Excel, XML files in your PDF. For instance, in production, if your ERP, MRP, HRP, CRM software is producing invoices, the invoice produced by DocOrigin in PDF/A-3 can contain the matching PO and any other files that are relevant to that invoice. With DocOrigin, you can now generate universally accessible documents and forms that are appropriate for all of these readers – without complex post-processing tools and include all important materials needed. It’s the fastest way from raw Data to PDF/UA! Dynamic Fillable Forms allow customers to sign on their device and send back to you. 11. We also do dynamic fillable forms! Your business needs to collect and present information! Most of the time, information is collected from customers, employees, vendors or partners through the use of a form and then the data is delivered to you using an appropriate web service or portal. DocOrigin is an enterprise-class software solution that combines a professional graphical form designer with a powerful production engine capable of serving up documents and forms for the most demanding global companies. 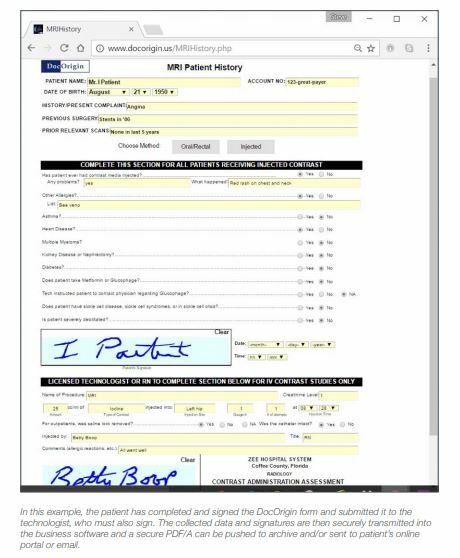 Whether you are designing forms to collect data on mobile devices or desktops – or you need to generate millions of production documents in electronic or printed format – or labels for patient wristbands or manufacturing or shipping – DocOrigin provides the dynamic fillable form solution you need. 12. We have a thriving OEM software partnership program. At Eclipse Corporation, we believe the primary risks in entering OEM software partnerships are found in the time frame between the decision to add additional capability to the existing product line and the break-even point of investment and revenue generation. The solitary focus of our OEM software partnerships program is to mitigate the risks in that time frame through investment and resource commitments, allowing our OEM partners to bring new solutions to market more quickly, align investment with cash flow, and enjoy higher returns on product sales. Need robust world class form, document, and label design and delivery in your commercial software? Find out why Advantage 360, GE Healthcare, Guidewire, Tyler Technologies,… chose DocOrigin! We hope you’ve learned a few new things about Eclipse and DocOrigin! If there is more you would like to know, please contact us to get in touch!